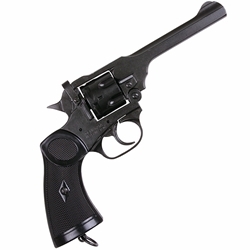 The Mk IV Webley Revolver is an historic British revolver and uniquely represented in this non-firing replica. The action works just like the original, with working parts and moving action. The Webley Revolver was a featured Gun in the "Indiana Jones" Movies.